Our Abpromise guarantee covers the use of ab49061 in the following tested applications. WB Use a concentration of 1.25 µg/ml. Detects a band of approximately 78 kDa (predicted molecular weight: 86 kDa).Can be blocked with Human SATB1 peptide (ab111669). Good results were obtained when blocked with 5% non-fat dry milk in 0.05% PBS-T.
Crucial silencing factor contributing to the initiation of X inactivation mediated by Xist RNA that occurs during embryogenesis and in lymphoma (By similarity). Binds to DNA at special AT-rich sequences, the consensus SATB1-binding sequence (CSBS), at nuclear matrix- or scaffold-associated regions. Thought to recognize the sugar-phosphate structure of double-stranded DNA. Transcriptional repressor controlling nuclear and viral gene expression in a phosphorylated and acetylated status-dependent manner, by binding to matrix attachment regions (MARs) of DNA and inducing a local chromatin-loop remodeling. Acts as a docking site for several chromatin remodeling enzymes (e.g. PML at the MHC-I locus) and also by recruiting corepressors (HDACs) or coactivators (HATs) directly to promoters and enhancers. Modulates genes that are essential in the maturation of the immune T-cell CD8SP from thymocytes. Required for the switching of fetal globin species, and beta- and gamma-globin genes regulation during erythroid differentiation. Plays a role in chromatin organization and nuclear architecture during apoptosis. Interacts with the unique region (UR) of cytomegalovirus (CMV). Alu-like motifs and SATB1-binding sites provide a unique chromatin context which seems preferentially targeted by the HIV-1 integration machinery. Moreover, HIV-1 Tat may overcome SATB1-mediated repression of IL2 and IL2RA (interleukin) in T-cells by binding to the same domain than HDAC1. Delineates specific epigenetic modifications at target gene loci, directly upregulating metastasis-associated genes while downregulating tumor-suppressor genes. Reprograms chromatin organization and the transcription profiles of breast tumors to promote growth and metastasis. Sumoylated. Sumoylation promotes cleavage by caspases. Phosphorylated by PKC. Acetylated by PCAF. Phosphorylated form interacts with HDAC1, but unphosphorylated form interacts with PCAF. DNA binding properties are activated by phosphorylation and inactivated by acetylation. In opposition, gene expression is down-regulated by phosphorylation but up-regulated by acetylation. Cleaved at Asp-254 by caspase-3 and caspase-6 during T-cell apoptosis in thymus and during B-cell stimulation. The cleaved forms can not dimerize and lose transcription regulation function because of impaired DNA and chromatin association. Nucleus matrix. Nucleus > PML body. Organized into a cage-like network anchoring loops of heterochromatin and tethering specialized DNA sequences. When sumoylated, localized in promyelocytic leukemia nuclear bodies. 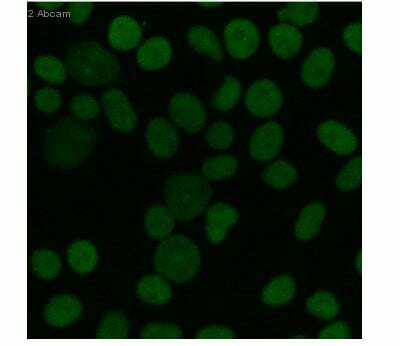 Immunocytochemistry/ Immunofluorescence - Anti-SATB1 antibody (ab49061)Image courtesy of an anonymous Abreview. 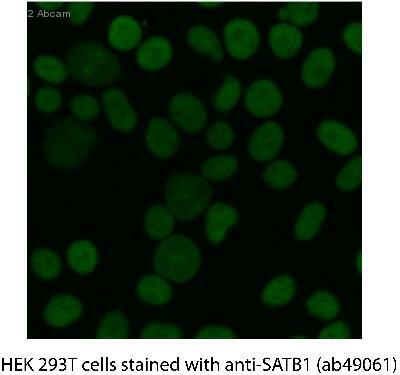 ab49061 staining SATB1 in HEK 293T cells by Immunocytochemistry/ Immunofluorescence. Cells were fixed with formaldehyde, permeabilized using 0.1 % Triton X-100 for 5 minutes, blocked with 2% BSA for 1 hour at 25°C and then incubated with ab49061 at a 1/100 dilution for 3 hours at 25°C. The secondary used was an Oregon Green 488 conjugated goat anti-rabbit polyclonal used at a 1/200 dilution. Estrogen Related Receptor gamma was immunoprecipitated using 0.5mg Jurkat whole cell extract, 5µg of Rabbit polyclonal to Estrogen Related Receptor gamma and 50µl of protein G magnetic beads (+). No antibody was added to the control (-). 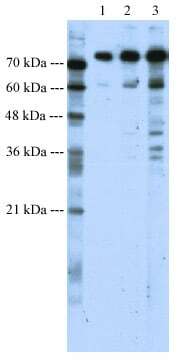 The antibody was incubated under agitation with Protein G beads for 10min, lysate diluted in RIPA buffer was added to each sample and incubated for a further 10min under agitation. Proteins were eluted by addition of 40µl SDS loading buffer and incubated for 10min at 70oC; 10µl of each sample was separated on a SDS PAGE gel, transferred to a nitrocellulose membrane, blocked with 5% BSA and probed with ab49061. Publishing research using ab49061? Please let us know so that we can cite the reference in this datasheet. Could you please let me know if the lysate was from activated Jurkat cells? Or could I ask you to provide us with some lysate to test the Ab? And we could also provide you with the immunizing peptide to block the antibody and assess the multiple bands observed. Typical turnaround time for synthesizing and delivering the peptide is 3-4 weeks. I hope this helps. Please let me know how you would like to proceed. which band to consider as SATB1 as all differ from the suggested 78kDA. WB. I have used Thymus extract previously and compared it to ESCs. I am sorry to hear you have had difficulty obtaining satisfactory results from this antibody. I would encourage you trying this lysate as positive control if available. 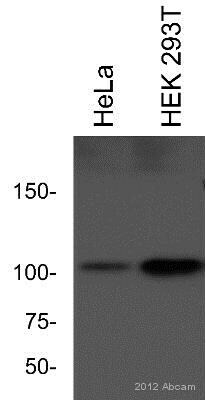 However, if you still experience problems using this antibody in WB, please do not hesitate to contact us back. We will happily offer technical support and in the event that a product is not functioning in the applications cited on the product data sheet (and the problem has been reported within 6 months of purchase), and if it appears that the antibody is at fault, a replacement/credit note/refund will be offered. I hope this was helpful. Please do not hesitate to contact us if you need any more advice or information. 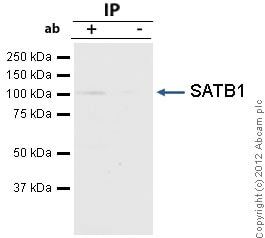 My colleague and I order anti-SATB1antibody from your company. We are confused about the dilution of it（ab49061） on IHC-P. Please reply as soon as possible！Thank you! Thank you for contacting us. We added IHC -P to the datasheet based on a reference that used the antibody for this application: Agrelo Ret al. SATB1 defines the developmental context for gene silencing by Xist in lymphoma and embryonic cells. Dev Cell 16:507-16 (2009). (PubMed: 19386260) Unfortunately, the paper does not include the protocol or dilution. I recommend testing the antibody at a dilution of 1/100 (10 ug/ml). This is assuming you use a standard secondary antibody directly conjugated to HRP or AP for detection. If you use a detection reagent that amplifies signal, for instance a polymer or avidin/biotin complex (ABC), then you may find that you can obtain a good signal at a lower dilution, for example 1/500, with less background staining. I hope this is helpful. If you are having difficulty obtaining a good specific stain for SATB1, please reply and include some details of your samples and protocol in your reply.